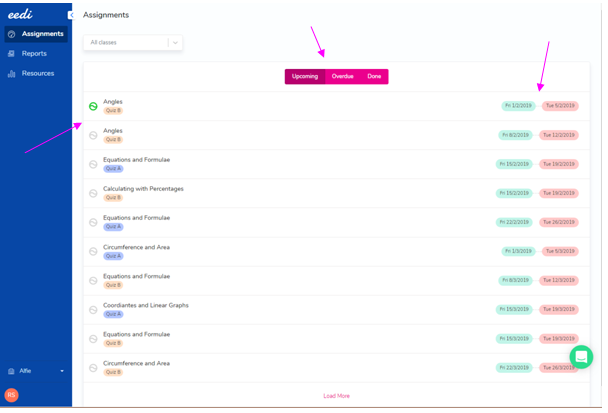 We have created an 'Assignments' page for parents, so you can keep up to date with upcoming, overdue and complete quizzes that your child has been assigned. 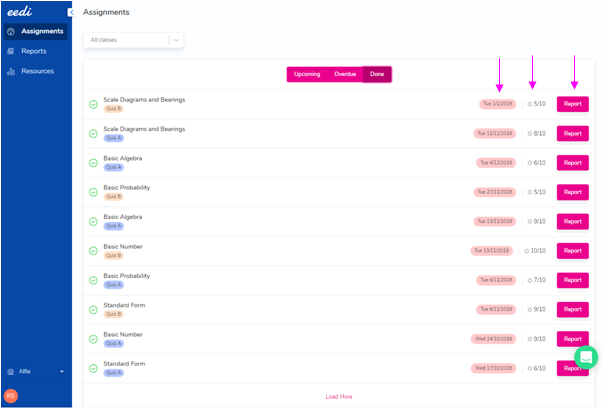 Take a look at the video and pointers below to see how you can make the most out of the Assignments page on Eedi. Here you will be able to see the drop down to select a specific class - This is useful if your child uses Eedi across different subjects. In green and red, on the right hand side, you can see the set and due date for the particular quiz. If you hover over either of these dates, it will give you notice in the format of 'Started 4 days ago' or 'Due in 5 days'. Quiz A and Quiz B are differentiated by colour - So you will be able to see which one is the first quiz set for the topic and which is the second quiz that is set 3 weeks later, to ensure retention of the subject. The green squiggle icon represents whether the quiz is accessible to students yet, if we have reached the set date. The ones that appear in grey are not available yet to start. These are all of the quizzes that have passed their due date and are classified as 'late'. 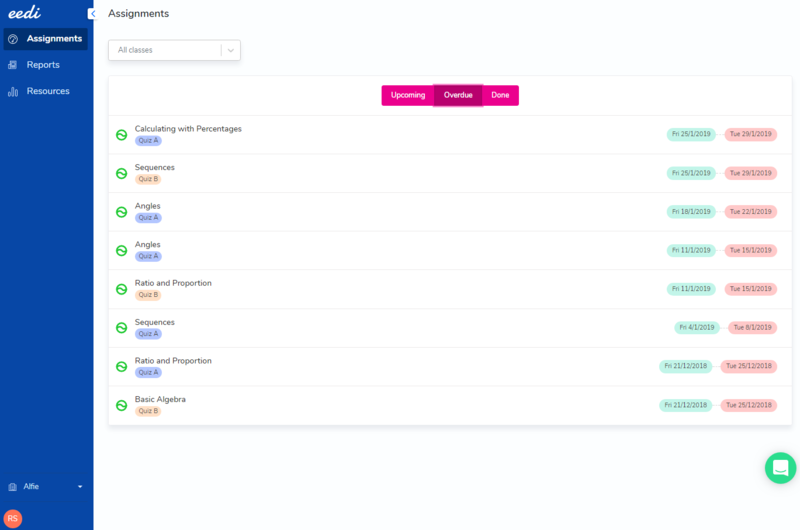 In addition to the above, on the done page, you will be able to access more detail in how your child has done in their specific quizzes. You will be able to see their score for their first attempt on the quiz. If you hover over the score, you will be able to see whether they made any improvements when attempting their incorrect answers and if so, how much they have improved by. You will be able to click straight into the specific report for the unit. This will take you into the report section. To find out more about how our report section works, click here.